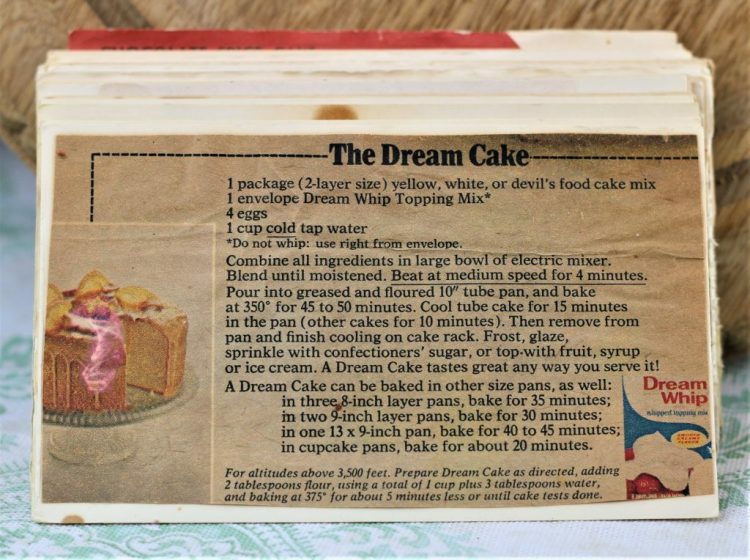 Front of the recipe card for The Dream Cake. 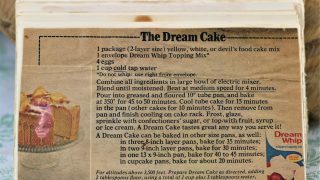 There are lots of fun recipes to read in the box this recipe for The Dream Cake was with. Use the links below to view other recipes similar to this The Dream Cake recipe. If you make this The Dream Cake recipe, please share your photos and comments below! *Do not whip: use right from envelope. Combine all ingredients in large bowl of electric mixer. Beat at medium speed for 4 minutes. Pour into greased and floured 10" tube cake for 15 minutes in the pan (other cake for 10 minutes). Then remove from pan and finish cooling on cake rack. Frost, glaze, sprinkle with confectioners' sugar, or top with fruit, syrup or ice cream. in cupcake pans, bake for about 20 minutes. For altitudes above 3,500 feet. Prepare Dream Cake as directed, adding 2 tablespoons flour, using a total of 1 cup plus 3 tablespoons water, and baking at 375° for about 5 minutes less or until cake tests done.